The best technical support and full air deflectors installation instructions. Lowest price Fiesta air deflectors guarantee and expert service. Ford Fiesta, 2012 air deflectors by WeatherTech are available from etrailer.com. 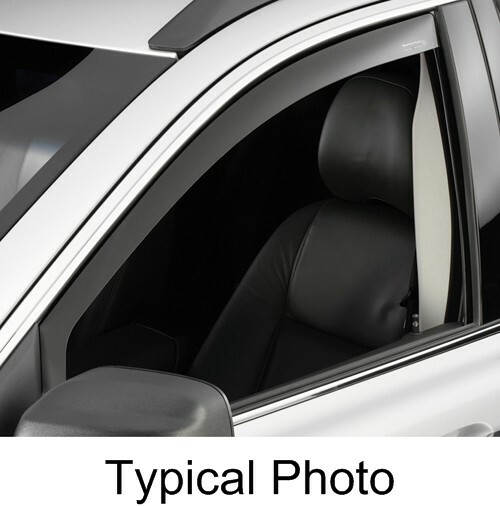 For expert service call 800-298-8924 to order your WeatherTech Side Window Air Deflectors with Dark Tinting - Front - 2 Piece part number WT80537, or order online at etrailer.com. Let fresh air in while keeping bad weather out. These heavily tinted air deflectors reduce wind noise and help to keep interior temperatures low by promoting better air circulation in your Ford Fiesta. Order: RelevanceNewestRating - High to LowRating - Low to High Let fresh air in while keeping bad weather out. These heavily tinted air deflectors reduce wind noise and help to keep interior temperatures low by promoting better air circulation in your vehicle. Still going strong. I expect these deflectors to last the life of the truck. I am so happy with this product. Its been a bit more than a year now on my vehicle and there is no fading, discoloration, cloudiness or cracking. The deflectors have never loosened or become maladjusted with the rolling of the windows up and down. And of course they do the job they are intended to do. Like I said in my review upon buying them, a great product. And from a great retailer. I dont think Ive ever experienced a retailer, much less an online retailer like etrailer.com that provides the service and customer care they do. And I have never had a company Ive done business with follow-up with me a year or so later and ask how things are with the product or service rendered. These people get it!! Jon, I called the manufacturer and verified that these are installed through the front flap, pushed up with the included special tool, where they will rest outside the seal, but inside the first flap of weatherstrip. Feel free to call us with any further questions. We would love to help! still look like new, no fading. Still love them! So easy to install, no glue to come loose. Outstanding! I put them on a Lexus RX 450h. They work perfectly, look great. Unlike cheap stick ons my chrome window molding is still visable to see.Quality is # 1. Do you have a question about this Air Deflector? Highest quality air deflectors for the best price. Most detailed, accurate air deflector information available.